...while it is ordinarily said that the forefathers of this [southeastern] section of Pennsylvania are of German descent, that such tradition is not strictly accurate. They are originally Swiss. Many of our ancestors, however, were pushed by prosecution from Switzerland into Germany and particularly into the Palatinate on the Rhine and lived there some years, migrating from that place to Eastern Pennsylvania. Page 88 of Swiss and German Pioneer Settlers of Southeastern Pennsylvania by H. Frank Eshleman. Originally published in 1917 and reprinted in 2000 in Baltimore, MD by the Genealogical Publishing Company, Inc. Page 9 of Pennsylvania German Roots Across the Ocean, edited by Marion F. Egge. Published by the Genealogical Society of Pennsylvania, 2000). 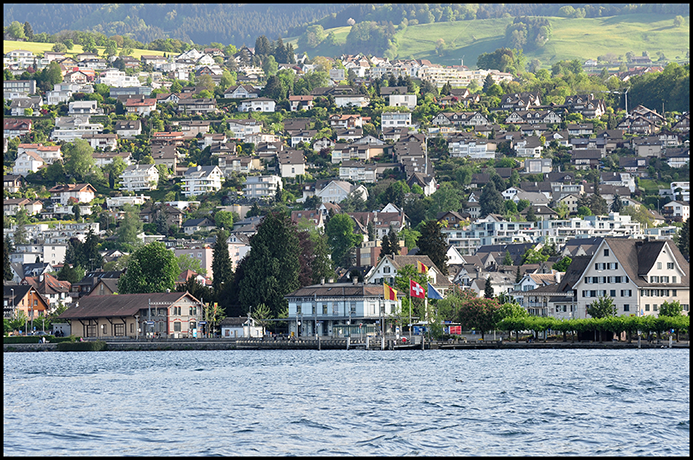 Having learnt, since I came to this place [Zurich, Switzerland], that a person of my name resides some ten or twelve miles [actually 28 km) up the lake [Lake Zurich], I set off in a hack in search of him. I found him. His name is Henry Hiestand, and is undoubtedly a branch of our family, but we could not trace our lineage or genealogy, and indeed that would be difficult in the absence of documentary evidence, as my ancestors have been from this country [Switzerland] one hundred and thirty years. 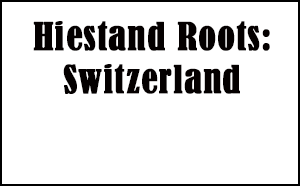 Note: If interpreted precisely, this would indicate that the Hiestand family left Switzerland (for Germany) in 1705. Page 147 of Travels in Germany, Prussia and Switzerland by Henry Hiestand (born 1788 in Shenandoah County, VA). This 1835 journal is available as a reprint from Amazon.com. Pages 291-292 of "From the Canton of Zurich, Switzerland" by Oscar Kuhns in The Pennsylvanian German, Volume 11: Editors Croll, Schuler, and Kriebel. 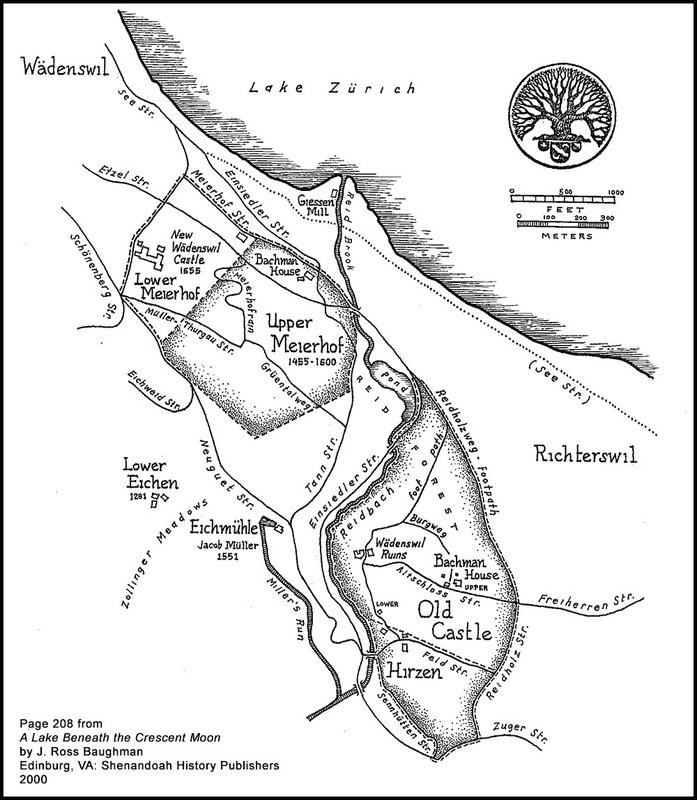 The village was probably founded in about 850 A.D., but is first mentioned by name (Richtliswile) in 1265 A.D. 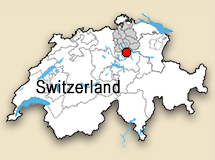 The people of Richterswil established quite a reputation for revolting against civic and religious authorities they deemed to be unjust, including the Anabaptist movement protesting the dominance of the Catholic Church and the Swiss Reformed Church in the 16th and 17th centuries and the Wädenswil tax revolt of 1645/46. One mile northwest of Richterswil, along the shore, is Wädenswil. Wädenswil is known for the Catholic Order of St. John and the "old" Wädenswil Castle, the ruins of which are within the municipality of Richterswil. With a 2015 population of more than 13,000 and 4,452 households, Richterswil is no longer a village. According to the 2008 census, 45% were Protestant (41.8% belonging to the Swiss Reformed Church), 34.5% were Catholic, 12.2% were atheists or agnostics, with the others begin Muslim, another religion, or an unnamed religion. In historical documents Richterswil, is referred to by a variety of names: Ruhteschweil, Richentenschwyl, Richtischwyl, and Richtischweil. Source: Page 665 of Documents of Brotherly Love: Dutch Mennonite Aid to Swiss Anabaptists, Volume I, 1635-1709. Millersburg, OH: Ohio Amish Library, 2007. "Notations of the earliest surnames around the castle were sporadic in the 1300s. Many of the common folk only kept first names and occasionally a secondary name that served as a locator. In the earliest regional tax lists from the Order of St. John, dating from 1402*, Hiestand [and other names] appeared for the first time." *Other sources indicate that 1401 was the date of the record. Source: Page 42 of A Lake Beneath the Crescent Moon by J. Ross Baughman. Edinburg, VA: Shenandoah History Publishers, 2000. 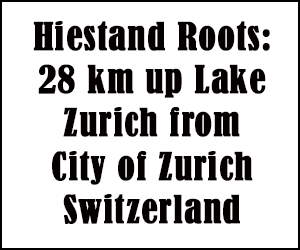 From that time on, up until the present day, the Hiestand name has appeared in Richterswil, although many Hiestands have emigrated from Switzerland and now appear around the world by the Hiestand name, or many variations that have morphed out of it. Although the name generally appears ending with a "d," German-written signatures of Henry Hiestand's sons, such as those of Peter, in his family Bible record, clearly ended with the consonant "t"--Hiestandt. And Daniel's 1777 German signature also appears to end with a "t." Even when English clerks put their English-minded spellings to the Swiss-German surname, often it is apparent that they heard the "t" ending when Henry's family members pronounced their names, as did the person who recorded the name of "Daniel Hasstont" for the petition to create White County, Tennessee in 1806. Page 317 of Americana Germanica, edited by Marion Dexter Learned. Volume IV, No. 1, 1901. Article: "Studies in Pennsylvania German Family Names" by Oscar Kuhns. Page 175 of Deutsche Familiennamen by Wilheim Tobler-Meyer (Zurich: Albert Muller's Verlag, 1894). The report of this Hiestand family conference was probably written in the 1970s or perhaps earlier. According to the first statement, the conference itself had occurred "years ago," prior to the written report. The report was originally written in German, then translated into English. The source of the document is unknown to us. 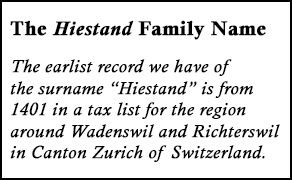 Years ago the rural district council, Emil Hiestand, took the trouble to probe into the origin of the name Hiestand, and how the name Strickler was related to it. He held a conference to investigate and gain information. After he had compiled material he was invited to a conference on Sunday, March 15, in the Freihof court. Of the 80 invited, 58 took part in the day long conference. In his welcoming speech, Emil Hiestand expressed that he wished to give a report on the family information he had gathered, so that the coming generations come make a family history (tree) of their descent. The genealogical and historical proof could have been gathered from the state archives of Zurich, the central library of Zurich, the community Archive of Richterswil, and the charitable Archive of the people of the convent. Also information is here of how the Stricklers originated out of the family of Hiestand. The custom is to bear two names. It came about inn the 12th century. It was first only done by noblemen. Later, the common man made this a practice. Some called themselves by their surnames, while others used the names of their professions. This second group is where the name Hiestand belongs. A small space was placed between the letters "e" and "s." Most likely the name was derived from the words "hie" and "stand." (Meaning literally, "new" [most other sources indicate "here"] and "stand"). Strangely it was never changed from its origin. The name Hiestand was first mentioned in 1401 in the log of the ship, Heinrich Hiestand. In 1402, Heine Hiestand and in 1425 Klaus Hiestand in Erlen, Wollerau, were both mentioned at the conference. Nearly all generations had their own coat of arms. The first coat of arms was a swinging horn with three stars, then there was another similar to it, but with an anchor and three stars. 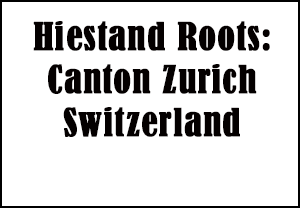 At present there are 12 families and 10 single persons in Richterswil with the name Hiestand, and 14 families in Wädenswil. 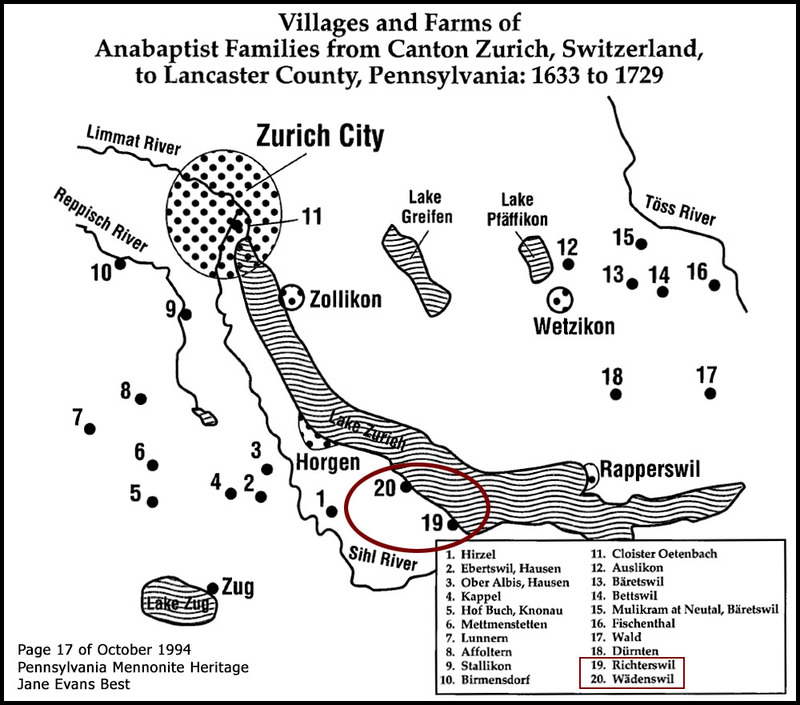 The families moved mostly to the farms especially near Wollerau and Freienbach, as also in Wädenswil and the mountain communities. As the chronicles show, there were also emigrants. In 1657, three Hiestands left and 1669 Conrad, Jakob and Klyare Hiestand left from the Ybschen farm in the German province of Pfalz and spread later to the Black Forest Area. A ship traveled from Rotterdam to Philadelphia in 1727, 1731, and 1754 with a captain by the name of Hiestand. How large the ship was is not known. Some reporter also found a 10 dollar note which was signed by a Hiestand. 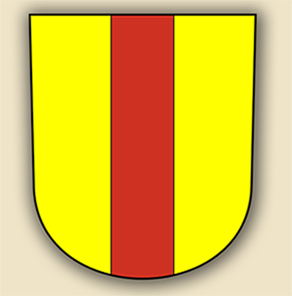 Also in many campaigns (presumably war campaigns) Hiestands were advocates: the campaign of Burgund Uli Hiestand in 1512, in the fight with Novarra Hans Hiestand, and in the campaign of Lombardei, where two Hans Hiestands were advocates. In almost two hours, the origin of the family of Hiestand was illustrated. Twelve years earlier the reporter had collected the noted material which demanded patience and much work, and I hope again such a conference may be held, where we can also be able to explain the origins of the various family coats of arms.